An account of the decline and crushing of the anarcho-syndicalist trade union the FAUD in Hitler's Germany. On 5th November 1937, Julius Nolden, a car plant worker from Duisburg was sentenced by the "The People's Court" in Berlin to a ten year prison term for "preparing an act of high treason with aggravating circumstances." Nolden had been at the head of the FAUD (anarcho-syndicalist Free Union of German Workers, part of the International Workers Association) in the Rhineland when that underground Organisation was dismantled by the Gestapo in January 1937. Arrested with him were 88 other male and female anarcho-syndicalists who stood trial in the Rhineland in early 1938. 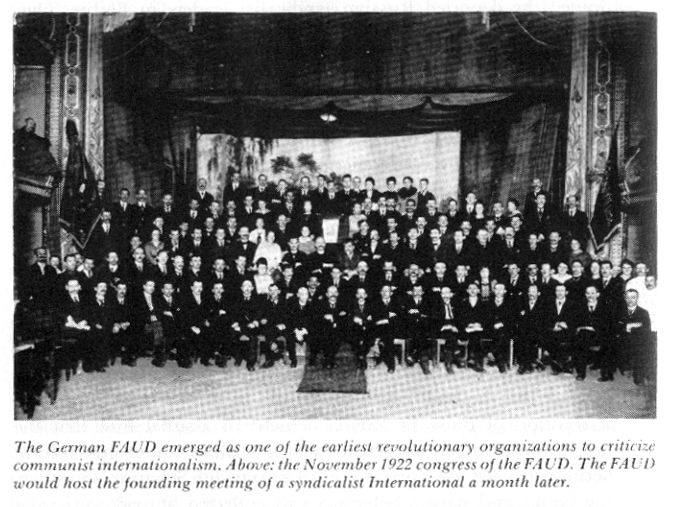 In 1921 the FAUD in Duisburg had around 5,000 members. After then the numbers fell and by the time Adolf Hitler came to power in 1933, only a few tiny groups remained. For example, there were about 25 militants active in the Duisburg area and the Rhineland regional union had around 180-200 dues-paying members. At its last regional Congress, held in Erfurt in March 1932, the FAUD had decided that, in the event of the Nazis taking power, its federal bureau in Berlin would be shut down and replaced by an underground directorate (based in Erfurt) and that there would have to be a general strike by way of reply. The latter decision proved impracticable: for one thing ' the FAUD right across Germany was decimated by a wave of arrests. In April-May 1933, Dr. Gerhardt Wartenburg, before being obliged to flee the country, managed to find a replacement for himself as secretary of the FAUD in the person of Emil Zehner, an Erfurt blacksmith. Wartenburg fled to Holland, to Amsterdam, where he was welcomed along with other German émigrés, by the Dutch anarcho-syndicalist, Albert de Jong* Similarly, the International Workers' Association (IWA, the embracing trade unions of a libertarian and revolutionary bent) secretariat was moved to the Netherlands but that did not prevent the organisation's archives from falling into the hands of the Nazis. In autumn 1933, Emil Zehner was replaced by Ferdinand Gotze, a member of the Saxony Chamber of Labour, then run by Richard Thiede from Leipzig. Meanwhile in the autumn of 1934 Gotze, on the run from the Gestapo, turned up again in the west of Germany where support fro. the Dutch federation of the IWA (the NSV) had made it possible to establish an underground FAUD group. At the same time and in all haste an FAUD secretariat in exile had been set up in Amsterdam. Up until the Nazis took power, labourer Franz Bunged had headed the Duisburg federation. He was interned in the Bogermoor concentration camp without any semblance of a trial in 1933. Bungert was released within a year but found it absolutely impossible to engage in even the least illegal activity because of the strict surveillance under which he was kept His place was taken by Julius Nolden, a Steelworker unemployed at the time. tip to that point, Nolden had been treasurer of the Rhineland Chamber of Labour. Nolden too was arrested by the Gestapo who suspected that his job with an incineration plant was a cover for illegal contacts with other FAUD members. In June 1933, a little after he was released, Nolden met Karolus Heber, a member of the underground Erfurt directorate, The Object of their meeting was to organise the clandestine escape of compromised colleagues to Holland and to launch a resistance Organisation in the Rhineland and Rhur districts, Nolden and his colleagues laid the groundwork for a network to smuggle people out to Amsterdam and distributed antifascist propaganda. It transpires from the court records that anti-Nazi pamphlets circulating at the time under cover of the title "Eat German fruit and stay healthy', were so popular among miners that they used to greet each other with: "Have you eaten German fruit as well?" After 1935 and the improving economic position inside the country, it was increasingly difficult to keep an illegal anarcho-syndicalist organisation afloat. Many comrades had found work again after years of unemployment and casual labour and were reluctant to involve themselves in active resistance. The Gestapo terror did the rest. Furthermore, the support from Amsterdam dried up in 1935. The outbreak of the Spanish revolution in 1936 gave a boost to anarcho-syndicalist activity inside Germany. Nolden built up his contacts with Duisburg, Dusseldorf and Cologne, organised meetings and launched subscriptions to raise financial support for the Spanish comrades. At the same time, Simon Wehre, from Aix-la-Chapelle (Aachen), used the Rhineland Chamber of Labour's network to recruit volunteer technicians prepared to go to Spain. In December 1936, the Gestapo, thanks to a spy planted within, managed to uncover the existence of groups in the cities of Munchengladbach, Dulken and Viersen. At the beginning of 1937, the political police rounded up 50 anarcho-syndicalists from Duisburg, Dusseldorf and Cologne. Nolden was among those arrested. A little later, further arrests were made and these brought the number of members of the outlawed FAUD in Gestapo clutches to 89, It took a year to build the case against them. These male and female comrades were charged with "preparing acts of high treason" and they were brought before the courts in January and February of 1938. Several comrades were murdered in prison. The Duisburg lathe-operator, Emil Mahnert, according to the testimony of four other inmates, was hurled form two storeys up by a police torturer. The bricklayer, Wilhelm Schmitz died in prison on 29 January 1944 and the circumstances of his death have never been properly clarified. Ernst Holtznagel was dispatched to the notorious 999 punishment battalion, where he was killed. Michael Delissen from Munchengladbach was beaten to death by the Gestapo in December 1936. Anton Rosinke from Dusseldorf was murdered in February 1937. In August 1946, the Dusseldorf anarcho-syndicalist Ernst Binder wrote: 'Since mass resistance was not feasible in 1933, the finest members of the movement had to squander their energy in a hopeless guerrilla campaign. But if workers will draw from that painful experiment the lesson that only a united defence at the proper time is effective in the struggle against fascism, their sacrifices will not have been in vain." Does anyone know if Emil Zehner is the same guy who designed the Zehna 6.35mm pistol? The story here says he was a blacksmith. Another source says he was a locksmith. I wonder if he weren't really a gunsmith? This is correct and not at the same time. Nowadays Duisburg was subject to two communal area reforms in 1929 and the late seventieth. The Duisburg of 1921 was only a small portion of what the city is today and did not include syndcalist centres such as Marxloh, Hamborn, Hochemmerich then. If you count the FAUD membership from 1921 in the towns that today make the city of Duisburg, the membership was not 5.000 but 23.000 to 26.000. Nearly one in five of the overall FAUD membership in 1921 thus lived in what is now the city of Duisburg, most of them miners and workers in the steel industry. There are estimates that up to 40% of the membership of the "Red Ruhr army" in march 1920 was made of FAUD members.